Fathis Aren, a Dunmer sorcerer, is an Associate of the Mages Guild and the castle mage in Bravil. He also offers basic Conjuration training all day long. Among his prized possessions is the famous Arrow of Extrication, which has recently come to the attention of the Gray Fox. He is very rarely seen at the Bravil Mages Guild, preferring to work in the privacy of his own study in Castle Bravil. He definitely has problems sleeping, since he can be found restlessly wandering his private quarters between midnight and 2pm. He then equips his armor and dagger and sets off for the local Guild Hall, removing his weapon once he arrives. He stays there until 5pm, strolling around and chatting with his fellow guild mates. After un-equipping his armor too, he trudges back to the castle; where he spends his time pacing around his quarters before attending the Count's formal dinner between 8pm and midnight. He then retires to his quarters for another sleepless night. During the related quest he will be found in his own, private dungeon: Fathis Aren's Tower; but only after the Gray Fox has told you about your reward. He will then spend the whole day practicing his alchemical skills in his quarters in the second-to-highest level, not even eating or sleeping, supposedly keeping an eye out for thieves. If he catches you trying to steal the arrow, he will proceed to attack you. He wears middle-class attire consisting of a burgundy linen shirt, burgundy linens, and a pair of quilted shoes. However, he is mostly seen wearing a leveled heavy cuirass, which he only takes off at dinner. He also possesses a leveled amount of gold, a castle key, an interior castle key, and a strange key. In combat, he relies on a fine steel dagger, a leveled staff (starting from level 5) and a leveled set of sorcerer spells. He also possesses the standard conjurer birthsign. His quarters, which are locked, can be found in Bravil Castle North Wing. Other than his bed, he owns two very interesting chests; both of which are locked. The first has fair chance (50%) of containing some gold, a piece of armor and a weapon and a small chance (25% each) of containing two filled soul gems, three empty ones and a gem. The second has a small chance (25% each) of containing two pieces of jewelry and three scrolls and a fair chance (50%) of containing some gold. When you meet him for the first time it becomes clear that he is rather bored with life in the castle: "I'm Fathis Aren, Count Bravil's staff wizard. I can teach you Conjuration... anything to relieve the tedium of castle patronage." When asked about Bravil he will speak ironically of Count Regulus Terentius' way of running the county: "Far be it from me to criticize my patron and sovereign. Bravil obviously flourishes under his wise and beneficent rule." In downtown Bravil, the townsfolk will often discuss and admire Fathis and his conjuration skills: "I understand that Fathis Aren is quite the conjurer. ", "If you're looking to learn about conjuring creatures, you should try to speak with Fathis Aren. ", "Have you ever seen Fathis Aren conjure up a creature? ", "Don't you find Fathis Aren's skill in Conjuration impressive? ", "I don't have any interest in learning about Conjuration, but I hear he's very good." and "I don't have a lot of interest in Conjuration, myself. I suppose if I did, I'd want to talk to Fathis." Fathis' conjuration experiments have garnered a lot of attention. 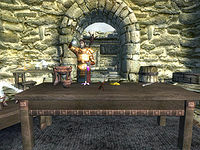 The Gray Fox will, when initiating the Arrow of Extrication quest, explain how to find the arrow: "Bravil's court wizard, Fathis Aren, recently acquired this unique item. You may kill Fathis if necessary, but not in the castle." In Bravil, the eyes and ears of the Fox will elaborate: "Fathis is also the wizard in the tower southeast of town. He keeps his most treasured items there, not in the castle. Only Fathis can open the door to the tower, but there is supposed to be a secret passage somewhere in the castle that leads him to his tower." The common citizens in Bravil will also discuss the odd wizard: "He's the court wizard. He has a room in the north wing. Gloomy fellow. I've heard he consorts with daedra. I'd steer clear of him if I were you." Later on, in his Daedra-infested outdoor lab in his tower, if you try and steal his equipment of the arrow from his chest, the wizard will immediately attack you and shout out: "The Gray Fox dares to steal from Fathis Aren? "; "Fathis Aren's pockets are not for you, thief! "; "You dare to attack Fathis Aren? "; and "No-one steals from Fathis Aren!" After the related quest Bravil citizens will start to say: "Did you hear what happened? Someone robbed the wizard's tower. Fathis Aren got what he deserved, if you ask me." and "I heard that someone broke into the wizard's tower. What kind of a fool would take on Fathis Aren?" Arrow of Extrication: Steal an arrow for the Gray Fox. During the Arrow of Extrication quest, his Aggression will be set to 100, making it likely he will attack you on sight unless you are of a high rank in the Mages Guild. Once the quest is finished, his Aggression will return to normal. 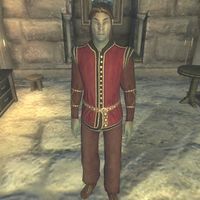 Apart from the Mages Guild he is also part of the Conjurer and Chorrol Citizen factions. The first is to make sure that he won't attack the Conjurers found in Bravil Wizard's Grotto, while the second seems to have no use. He is also the only named member of the conjurer faction. He has the same last name as Dovyn Aren and Savos Aren from Skyrim. However, there is no indication in the games that they are related. Fathis also appears to own all of the containers and the alchemical apparatus found in the exterior of Fort Caractacus. This is probably a mistake and the ownership should have been Ancotar's, who lives there. Between midday and 2pm, he is supposed to visit the Lucky Old Lady, and wander around near the statue. The conditions for this behavior seem to be designed to keep him away from the statue while the Dark Brotherhood descend to the Night Mother's crypt, but they are incorrect. The condition specifies that he only visits if Following a Lead hasn't reached stage 30, and Honor Thy Mother is at least at stage 100: in other words, you must have completed the Dark Brotherhood quest line but not yet found the Traitor's Diary. Since this is an impossible combination, he never makes the visit. Fathis should also sleep in his bed between midnight and 6am; however, because of a loading order problem, the package is never actually activated. Esta página foi modificada pela última vez à(s) 05h26min de 20 de outubro de 2015.